Are Bunions from Your Mother? Bunions or HAVs (hallux abducto- varus) is a deformity/misalignment of the big toe (1st MPJ), where the big toe slides across to either go under or over the 2nd toe. It affects many patients predominately women and can cause a wide variety of issues such as disfigurement, joint pain, nail issues, corn/callus pain, pain within the knee, hip and even lower back,. So should you thank your Mother for these bunions? Of course you should she is why you are here. But should you blame your mother for bunions – NO. Genetics (okay maybe your mother had a little part to play). This is not an exhaustive list by any means but are the main contributors. So how can you avoid bunions? That’s tricky, as you can see there are factors that you have no control over. But all is not lost making good choices early can and does make a huge impact on the level and severity of bunion formation. The important thing is early intervention. The shoes you spend the most amount of time in – work and exercise. Any recent X- rays of the feet – not to worry if you don’t have them we can refer you for them just like your doctor. Suitable clothing for the clinical assessment – pants that can be easily rolled above the knees would be ideal. There are a whole range of options available for bunion care. Which one is best for you depends on the severity of the bunion and what are you willing and or able to do. Recent research has shown significant improvements in alignment and function can be achieved with simple intervention. For example maintaining flexibility in the calf muscle is a key area for the care and treatment of not only bunions but for most foot issues. This is particularly an issue faced by women who tend to spend a large part of their life in some form of heel resulting in the calf muscle shorting which then pulls the ball of the foot down compared to the heel resulting in increased loading of the big toe joint. A simple and effective stretch is the straight leg calf stretch, holding the stretch for at least 15 seconds on each leg and repeat through you day when the opportunity arises. For women in their 5th decade of life and beyond another simple but effective exercise is to safely balance on one leg for 15 seconds several times a day this simple activity maintains the stabiliser muscles and structures at the foot and the entire lower limb. So what happens if I don’t do anything? As with all things in medicine there are no guarantees but a good indicator is what your mother’s feet look like. Joint pain in the joint itself. Pain in the ball of the foot. Skin builds up and or corn issues. 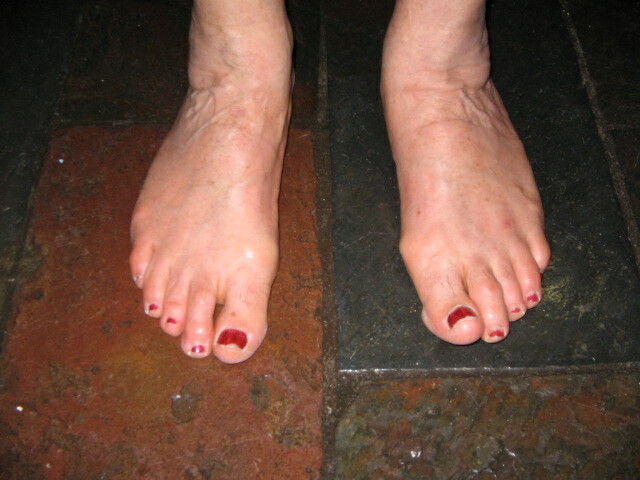 Change in the position and alignment of the other toes. Shoe irritation, difficulty in find comfortable shoes. Shin and calf muscle pain. Increased risk of knee arthritis. Increased risk of hip and lower back pain. So ring up your Mum to tell her you love her and then give Absolute Podiatry a call. Copyright 2019 © Absolute Podiatry. All rights reserved.